The 17 Sustainable Development Goals (SDGs) spelt out by the international community and adopted by world leaders in 2015 are noble ones and attempt to cover a much wider and deeper range of issues that affect and will continue to affect humanity well into the future. There has certainly been much discussion on the goals and the role of women in achieving them. This is a conversation that has been taking place globally and at all levels of governance. There is even a dedicated goal – goal 5: Gender Equality – to address the issues of gender in sustainable development. However, we may not have learnt enough from our experiences with the SDGs’ predecessor, the Millennium Development Goals (MDGs), especially when we start looking at gender equality. For one, funding gaps for the SDGs remain rather wide in some parts of the world as it was in the MDGs. For example, according to a recent report this month, in the Asharq Al-Awsat, a premier pan-Arab daily newspaper, Islamic countries suffer nearly a trillion-dollar gap in funding for the SDGs. According to the article, the gap prevents these countries from addressing infrastructural shortfalls in working towards the SDGs but it would not be a far stretch to assume that the gap also hinders the operationalising of programmes for women and gender equality. The issue of insufficient funding is a similar one faced when trying to achieve the MDGs. For gender equality in particular, this was further compounded by limited vision as to what was needed and the lack of political will. Although trying to achieve the MDGs did result in more girls receiving an education and more women being able to start small businesses and standing in local elections, there is still quite a way to go to achieve any form of parity. As a matter of fact, UN Women predicts that it will take about 50 years to achieve political parity and around 80 years before women can compete on equal terms with men in economic participation. It is hoped that the SDGs will be able to address this by widening the scope of the goals and their respective targets. This was certainly done as we have moved from eight MDGs to 17 rather specific SDGs. But the legacy of ineffectual action seems to haunt goal 5, that of equality for women and girls, funding being one of them. Without strong political will and the financial resources to back it up, we may be paddling upstream again, this time without oars and with larger numbers and greater complications thrown in, such as climate change, civil conflicts and mass movements of people. 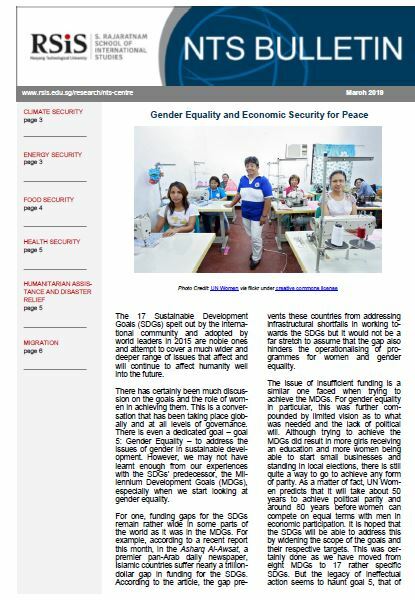 Closer to home, in Southeast Asia, we seem to be making some headway in gender issues, especially when connections are being made between gender equality and peace, justice and strong institutions (SDG goal 16). With the launch of the Women for Peace Registry (AWPR) in December 2018 and the plan for a three-part training – the first being in mediation and reconciliation with a focus on the sustained involvement of women held last month – by the ASEAN Institute of Peace and Reconciliation (AIPR), there seems to be some very important connections being made, which are vital for the realisation of SDGs in ASEAN member states. The peaked interest in the region on the Women, Peace and Security (WPS) agenda, stemming from UN Security Council Resolution 1325, is also a very welcome addition to discussions on gender equality and peace. However, we must guard against the critique of not “putting our money where our mouth is.” There needs to be greater support for widening knowledge on gender issues in the region and this needs to be backed by sufficient and sustained funding. But funding should not only be targeted at research programmes. We should also look into funding projects that help women achieve forms of financial independence. Discussions around the AWPR, AIPR and WPS do not give enough focus to the economic insecurities of women. Women as peace builders, the prevention of sexual and gender-based violence, the success in female radicalisation or even de-radicalisation for that matter, all in some way depend on forms of economic security and financial freedom for women. Therefore, we must try and make connections explicit between SDG goal 5 and goal 8: Decent Work and Economic Growth. Encouraging entrepreneurships, creating jobs specifically for women, and abolishing forced labour, sexual exploitation and human trafficking among other exploitative activities are key to integrating women fully and productively into the economic systems of member states, thus promoting decent work for all.